THE Los Angeles-based Beach Boys produced hit after hit in the 1960s thanks to the musical genius of Brian Wilson. Paul Dano plays the young Wilson while 20 years later John Cusack takes over the role. In 1966 Wilson inspired the iconic Pet Sounds, not just sitting at his piano in the recording studio but also directing the eclectic group of musicians. By the 1980s, though, he’s medicated and isolated and virtually a hermit in his LA mansion. Two people become important in this part of the top Beach Boy’s life. First there’s Melinda Ledbetter (Elizabeth Banks), amazingly compassionate for a Cadillac saleswoman. Brian’s response to her compassion is the most personal of confessions and Melinda has some hard yards to cover. That’s because the biggest influence on the neurotic songwriter is the Svengali-like psychologist and his legal guardian, Dr Eugene Landy (Paul Giamatti). He overdoses the songwriter on medication and virtually isolates Wilson from family and friends. Landy has diagnosed Wilson as paranoid schizophrenic and implores Ledbetter to “help me help Brian”. So it’s really up to Melinda to free Wilson. In real life she manages to do so and the two eventually married after she freed Wilson from the shrink’s clutches. Right at the beginning of the story Brian’s nasty dad dismisses one of Wilson’s greatest songs God Only Knows as ‘wishy-washy’. Now I can’t get the melody and the words of my favourite Beach Boys song “everybody’s gone surfin’ – surfin’ USA” out of my head. It was in there half a century ago when the Beach Boys were in their prime and Brian Wilson was their inspiration. It’s back in there, once more. 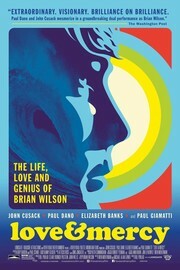 This entry was posted in Movies, Music and tagged Beach Boys, Brian Wilson, Love & Mercy. Bookmark the permalink.